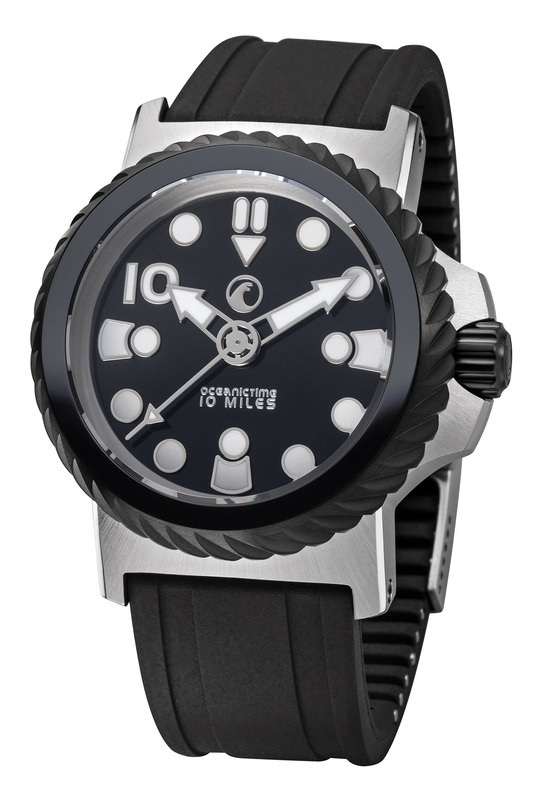 TimeTechTalk.com > Time Tech Talk > Time Talk > 10yr Anni Oceanictime/H2O 10 mile watch! OceanicTime, a blog dedicated to diver’s watches, is celebrating its 10th anniversary by partnering with H2O Watch to reinforce its Kalmar 2 dive watch to reach a STAGGERING water-resistance of 10 miles. OceanicTime was founded by British dive watch enthusiast, Lex Martine, in 2008. Best known for its daily blogs, the site also works on collaborative projects to modify existing dive watches into special editions. They’ve partnered with H2O Watch, a German tool-watch brand founded in 2010 that specializes in deepwater resistance, to create the Kalmar 2x OceanicTime 10 Miles edition. For a little context, the deepest part of the ocean is the Challenger Deep, located in the western Pacific Ocean with a depth of approximately 6.9 miles. A scuba diver can descend to a maximum depth of 1,090 feet (approx. 332 metres, a record set by Ahmed Gabr) and only a few specialized submersibles have ever reached the Challenger Deep. Why does a watch need such an unattainable depth rating? Well, why not? Let’s take a closer look at this groundbreaking achievement. The previous Kalmar 2 was OceanicTime’s special edition with H2O back in 2015, able to reach a depth of 8,000 metres (5 miles). The two companies are back to double that depth rating, now beating all Swiss mechanical watches by 4,000 metres (total of 16,093 metres). The Rolex Deepsea Challenge, which is rated for 12,000 metres, is a prototype that will never be commercialized as such. Other watches such as the Bell & Ross Hydromax or the Sinn UX Hydro can reach 11,000 or 12,000 metres but thanks to liquid-filled cases and quartz movements. The Kalmar 10 Miles is mechanical AND available. Starting with the 42.5mm case, the special edition utilizes a favourite of H2O – Grade 5 titanium. It’s almost twice as strong as 316L stainless steel and 40% lighter. It also has a hardness of 349 Vickers, while 316L stainless steel is rated at 152. And titanium is a hypoallergenic material. Two different domed sapphire crystals are available, both rated for 10 miles but varying in thickness for aesthetic purposes. They come in either 8.25mm or 10.50mm thick. The unidirectional bezel is unmarked and simply a black ceramic inlay, and although seemingly useless, still shields the crystal’s bulk. It has an oversized knurled edge that can easily be turned with gloves (although again, it’s unmarked). The screw-down crown is guarded and has multiple seals, and the solid caseback has dual VITON gaskets, which are resistant to chemicals, salt water and extreme pressure. Ironically, there’s an engraved scuba diver on the back, who can only dream of reaching such extreme depths. This marvel on your wrist has some heft at 22.85mm in height, but it’s basically a time-telling submersible tool and the diameter is actually very wearable. 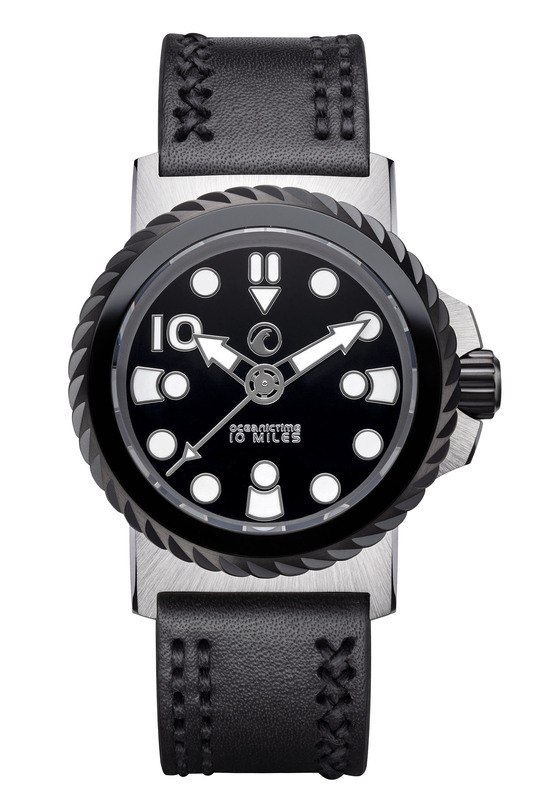 A Deep Black version is also available with a DLC-coating on the bezel, crown and caseback. 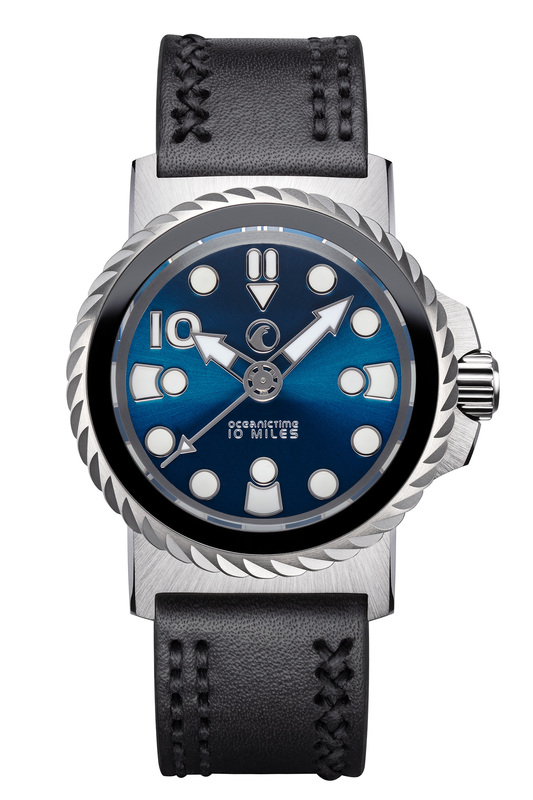 The dial comes in three sunburst finishes – dark anthracite, deep black and abyss blue. To keep things simple and maintain maximum legibility, there isn’t a date window or even a minute track. 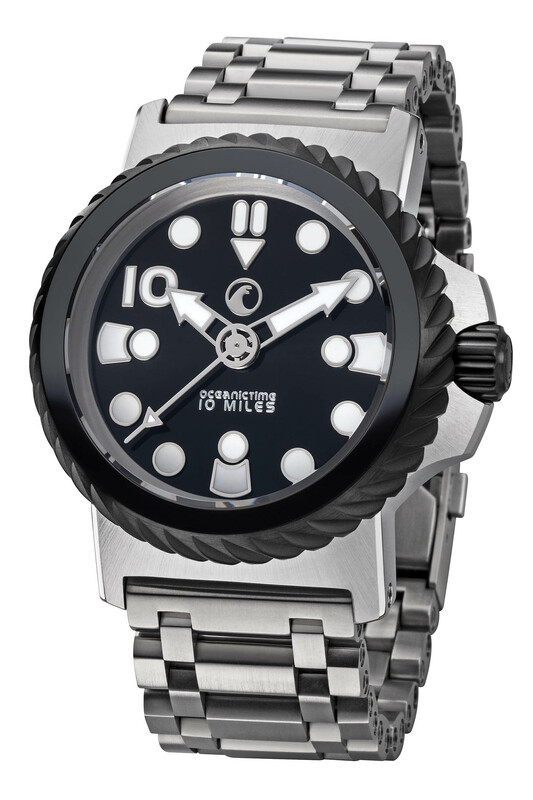 Oversized applied indices with chrome dominate the dial, while a single Arabic numeral – 10 – symbolizes both 10 miles and OceanicTime’s 10th anniversary. Chromed arrowhead hour and minute hands are filled with Super-LumiNova BGW9, as are all dial markers, emitting a bright blue glow. A chrome arrowhead seconds hand has a small spot of lume at its tip. H2O’s applied logo is at the top, while oceanictime and 10 MILES are printed at the bottom. This is about as legible as a diver’s watch can get, which is important at the bottom of the world. The movement is an ETA 2892 (Top grade) automatic with 21 jewels, 28,800vph (4Hz) and a 42-hour power reserve. This movement has an available date complication, but it isn’t utilized in the 10 Miles piece. As a Top-grade movement, it’s adjusted in five positions with an average rate of +/- 4 seconds per day (with a maximum allowable variance of +/- 15 seconds). This is a higher-end movement from ETA. The one in the 10 Miles has a custom rotor and perlage, but it’s hidden behind the solid caseback. A version with Elaboré movement (less decorated) can be ordered too. The 10-mile depth rating is achieved using FEM software (finite element method) to test the case design in a virtual environment. Any structural performance issues were found and solved using the software, and then finished watches were tested at an independent German research facility. The 8.25mm crystal version failed at 25,300 metres while the 10.5mm crystal version failed at only 320 metres deeper. All 10 Miles watches have “25,300 CERTIFIED” engraved between the lugs. Although 16,093 metres is 10 miles, to achieve a proper certification, dive watches must have an additional 25% buffer beyond the stated water-resistance. Two straps are available, starting with a practical rubber with butterfly clasp. 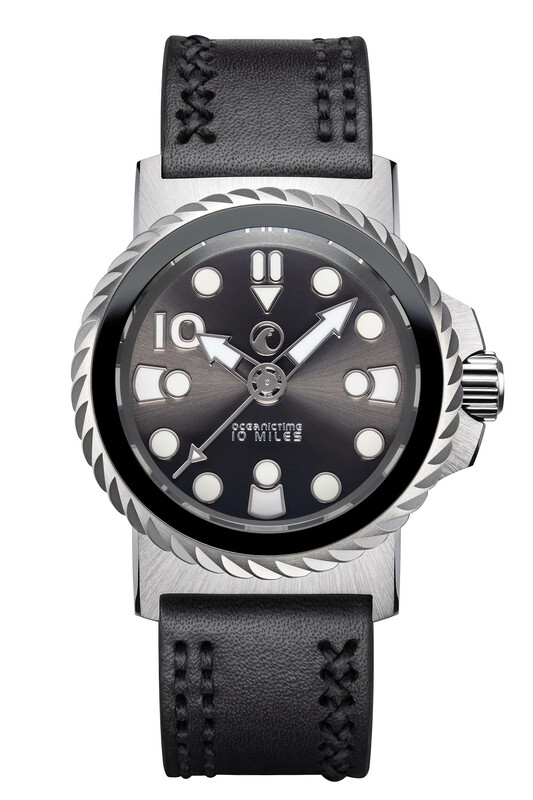 A black calf leather strap with black stitching is also included with a matching titanium buckle. A titanium bracelet will also be available as an option. Price of the H2O Watch Kalmar 2x OceanicTime 10 Miles will start at EUR 1,500, and it’s limited to 1,010 pieces. 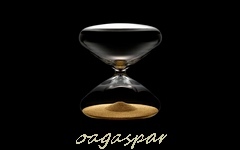 More information about OceanicTime can be found at oceanictime.blogspot.com and H2O Watch at http://www.h2o-watch.com. Page processed in 0.1574 seconds (17% database + 83% PHP). 27 queries executed.